You are an entrepreneur, but are not satisfied with how your business is going? 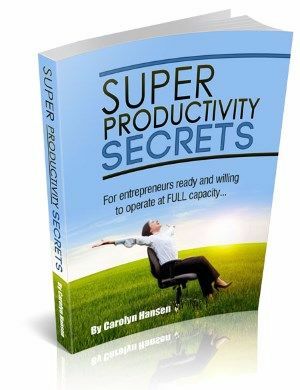 The book Super Productivity Secrets presents a unique methodology that allows businessmen to earn at full capacity. Labor productivity determines the degree of effectiveness of people’s expedient activities. It reflects the ability to produce a certain amount of consumer values ​​during a unit of working time. Efficiency of work – achievement by employees of the enterprise of the best results at smaller expenses. Labor productivity is characterized by the effectiveness of labor inputs in material production, determined by the volume of output per unit of time and the labor costs necessary for the production of a unit of labor. Increasing labor productivity involves reducing labor costs to produce a unit of output or manufacturing an additional number of products per unit of time. There is an increase in labor productivity with a decrease in the necessary share of living labor, with an increase in the proportion of materialized labor. Reducing labor costs in terms of producing a unit of consumer value – says about saving working time. The most important is the absolute reduction of labor costs, which are required to meet any social need. Consequently, the company needs to look for ways to save its material and labor resources – by reducing the number of workers in the plots where possible, saving on fuel, raw materials and energy. An increase in the mass of consumer values ​​that are produced per unit time. An important point in this case will be the results. They assume not only the expansion of their products, but also the improvement of quality. The change in the ratio of the costs of materialized and living labor. If production is used more extensively for past rather than living labor, the enterprise has opportunities to increase productivity, with the growth of society’s wealth. I wish every entrepreneur to reach a new level in his work. Earn more, live better and remember me with a good word sometimes. Thank you!